With so many superb food festivals celebrating the world of great cuisine taking place across the UK these days we decided to round-up the best GALAXY S4 and Note 8.0 apps to take advantage of all the great produce on offer and to turn you into a digital masterchef. So get your Samsung GALAXY S4 or Note 8.0 into the kitchen and let it help you hunt out local produce, find and organise recipes, choose the best accompaniments for meals or just put handy kitchen tools at your fingertips, helping you to make light work of even the most fiendish recipes. Foraging is all the rage nowadays, seeking out wild, seasonal produce to create great-tasting meals. To help you in your own foraging quest there's the Boskoi app, which lets foragers add reports of where you can find local food in your area to create a map of the edible landscape. Each report lets you navigate to the location marked using Google Maps, describes what food can be found there and will even have a link to the relevant Wikipedia page so you can learn more about the ingredients if you are unfamiliar with them. It's an open source project reliant on people tagging food they've found, so results will vary according to where you live, but it's well worth a try to help you source free ingredients. Seen an ingredient, technique or recipe you want to remember? Just whip out your GALAXY S4 or Note 8.0 and using the high-definition camera you can capture the moment, add a note or record a quick voice reminder. 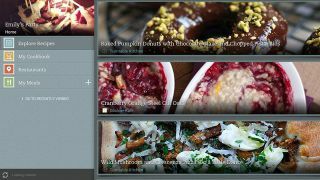 With Evernote Food at your fingertips, you'll never forget a great restaurant meal or a food festival cooking tip again. The app also has loads of great recipes to browse for inspiration, a restaurant locator plus a cookbook section for you to store your favourite recipes in. If you already have an Evernote account your recipes and notes will be backed up there too. Epicurious is a comprehensive recipe listings app with contributions from top chefs, restaurants and food magazines. If browsing a food festival has put you in the mood to create something extravagant, then choosing the "I cook like a pro" option will filter the 280,000 recipes listed on Epicurious to those that will really challenge you in the kitchen. Epicurious also offers categories like 'Weeknight dinners' and 'Decadent desserts', and lets you save recipes you really like to a Favourites menu. Also, if you've just bought a fancy ingredient from a farmer's market and aren't sure what to make, the Epicurious search function will find you a recipe by keyword, and it will save the other ingredients needed to create a shopping list too. Wouldn't it be great if you could collate all your favourite recipes together in one place, no matter how or where you found them? ChefTap does exactly this – you can import recipes from any website, import recipes stored as text files, import recipes from a URL, or just copy and paste them in directly. It can even search your Chrome bookmarks for recipes. It takes three taps on a browser to save a recipe (tap the browser Menu button, tap Share, tap ChefTap) and the app will import the recipe on the page, images and all. You can also edit anything if you want to amend it, add your own notes, or correct it. A truly impressive recipe organiser. Got a new favourite meal but don't know which wine will make the perfect accompaniment? Hello Vino is your friend. You can find the perfect wine for anything from roast turkey to Pad Thai and the wine suggestions are listed along with tasting notes and other food pairings, plus the ability to add the wine to your favourites.